Father's Day is on June 19th (and guess what?! My dad's birthday is the day after, then my fiance's birthday is a few days after his! Phew!) so it's time for a Father's Day Gift idea round up. I usually struggle a bit more with Father's Day than Mother's Day, as I know my mom and I share the same style-- so anything I like, she would like, too. With my dad, I usually ask him what he needs / wants and then get him something on his list. The above items are all things I know he would love. A new shirt, copper bottle opener, cologne, and Sperrys? 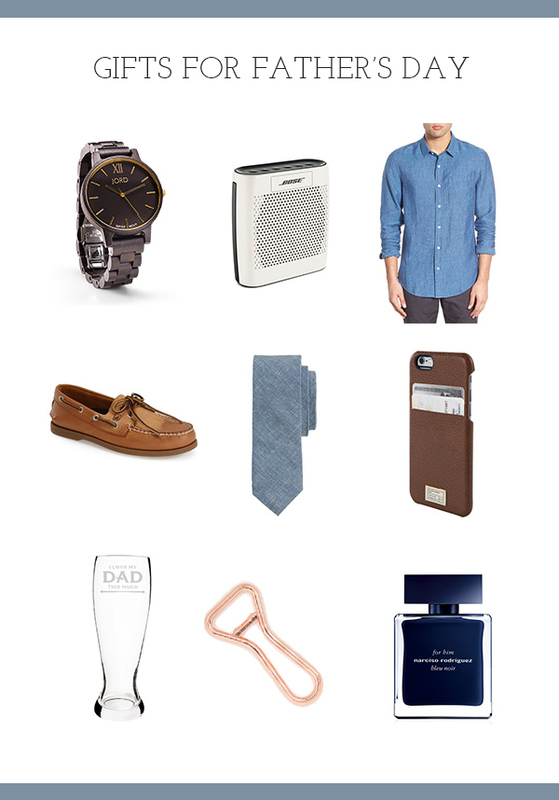 These are all tried and true gift ideas for our dad! Last year I got him the Sperrys I have pictured up there, and he loves them. - Subscription to a wine club or food service. My dad loves Munchery, since they live in the Bay Area. What's on your gift idea list for the dad's in your life? My dad loves to garden so I am getting him a fruit tree.